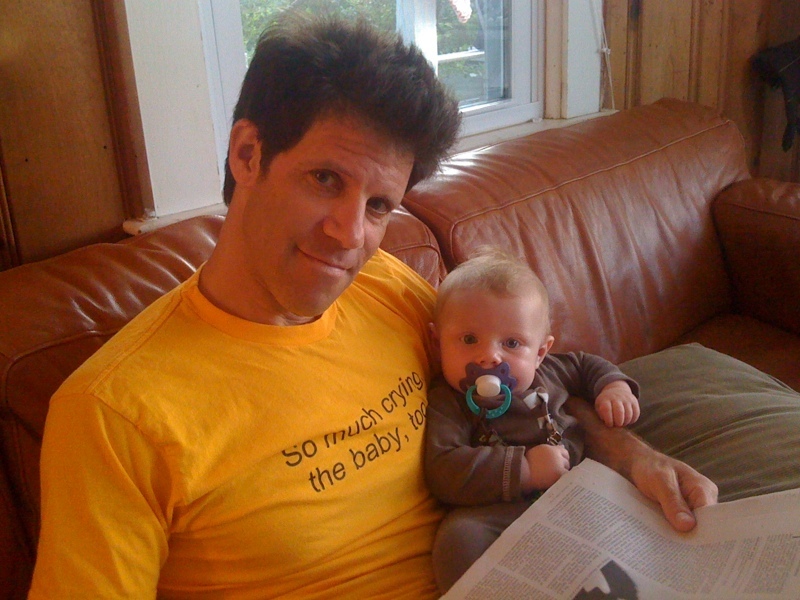 I’m the father of an 19-month-old boy (we’ve pictured here in my very early daddyhood days and I’m wearing my “So much crying; the baby, too” T-shirt) and have have experienced an enormous parenting learning curve, both from my own daily life and in talking to other parents. I’m inspired to share this knowledge and hungry to take in tips from others. Still, there’s little time to do so in today’s busy lives. What to do? I’ve begun doing what I already do best: seeking and sharing advice in six-word bites. So here’s the challenge for rookie and experienced moms and dads: share your best six-word advice on being a parent—something you’ve learned yourself or from others. Share your Six Words of Mom or Dad advice in the comments here, or over on our Facebook page. Who knows? Your advice could end up being put to excellent use by confused (and exhausted) parents across the world. Baby steps are for parents, too. Cushion the blows. Wipe the nose. Terrible twos assuaged by benevolent bourbons. Let them go to let them be. Your child deserves good old-fashioned respect. Children like radar in sensing emotions. Parents; enjoy learning to play again. It get’s easier after the 2nd. Grasping the toy means releasing the couch. May as well play. No returns. Parenting: days are long, years short. Remember: children are sponges, not sieves. Laugh, play, and read every day. They’ll remember the love, not possessions. Walk your talk. Play. Pray. Stay. They grow up fast so enjoy. Abounding love will conquer inevitable mistakes. Teach them not to need you. Don’t ever make parenting about you. Divert! Distract! Most underutilized parenting techniques. Young offspring make great ‘go fors’! Yes, Mom and Dad, advice, please? Breastfeeding’s worth it. Get good support. Build character. Sometimes, let them fail. At their worst, love them best. Catch falls, catch hugs, catch naps. They grow up but you don’t. “Don’t have children.” Felt like burden. Remind them you are always there. Worries never stop. Spending never stops. Relax, enjoy. Perfect parenting’s impossible. Say good-by to luxury of sleep. First fever. He survived. I didn’t. Kindergarten. Free tissues provided for parents. It’s ok if they get tattoos. Want peaceful dinner? Afternoon nap essential. Ego does not help at all. Assume they’re eavesdropping, just in case. It’s just hair, and it grows. Don’t waste No’s on trivial stuff. Remember, it’s their body, not yours. Be kind. Remember your own childhood. If you’re stressed, so is child. Hold hands until they let go. Buy toys. But buy YOUR favorites! Use information for choices not judgments. Play games and let them win. Don’t listen to other parents’ advice. Cheese and crackers is a meal. Sing silly songs, teach nursery rhymes. Pee on remotes, never suffer Caillou. Hard work but worth every sacrifice. You’ll hate them. Always love them. Public humiliation is a big no-no. Get babysitter, sanity requires time away. Teen slam doors? Take off hinges. Mothers of boys buy disposable gloves. Someday you’ll cherish these sleepless nights. Always have camera within arm’s reach. Grandparent’s number on speeddial. Takeout’s too. Screaming matches: Forfeit before you lose. Screaming matches: Forfeit before lose voice. Censor yourself. Swearing’s less cute eventually. Learn from children. They’re often right! Please don’t buy your children clowns. Laugh with them and laugh loud. Teach empathy. Model empathy. Be empathetic. Pray that the boys will clean. Penelope Leach: parenting sage and scholar. Car seats. Difficult to figure out. Kids all grown are still kids. “Don’t have kids.” Gee, thanks Mom. Black sheep make great pet projects. Girls should mow. Boys should sew. Love the naughty queer ones most. Son preferred yes/no answer to maybe. Get down to their level. Literally. Chronicle quirky comments and comical observations. Follow through on promises and punishments. Make the rule: try it once. There are never too many Legos. Your floor will never be cleaner. You teach them. They teach you. There’s already a you. Encourage individuality. Teach how to think, not what. Carrot purée stains everything it touches. First born is really just practice. Love your kids more than pets. Remember kids put everything in mouth. Never put kids on reality shows! Parenthood; not what you were expecting. Children never walk a straight line. Don’t be too big to apologize. Don’t overindulge, except love and hugs. Your gut usually trumps magazine experts. Wake sleeping baby. Pay the price. Don’t leave 2-yr-old alone with kitten. Cut their nails while they’re sleeping. They will criticise what you wear. Teach them to feel their feelings. Life teaches better than you. Relax. Fasten Velcro on bibs before washing. don’t do it! oops, too late! Stroke forehead gently. Works both ways. If you’re wicked, skip step parenting. Younger children, home alone, no no! Face in mirror while yelling. Telling. It’s only hair. Let it be. Swallow your ego before they do. Sing to them. Calms them unfailingly. Their taste will differ from yours. Visit with them while they sleep. Calm always wins, anger rarely does. You’ll never be free of them. Face your fears, then dismiss them. Snot won’t kill you. Poop might. Embarrass them in public whenever possible. A rocking chair calms you both. Rattles work for rattled adults too. Don’t despair, Cheerios is a side. Don’t ask stork for too many. Take lots of photos, time flies! Step back and let kids fail. Smother them with culture, music, travel. Only have as many as affordable. Take time for a family hug. Warm the Wipes. Cold isn’t cool. Ignored family advice - enjoyed messy child. My dad said, “should have raised pigs, not kids, you can always eat pigs”. your job: love, support, guide them. the best you can do: love them. I let my boys get dirty. All great actors began with tantrums. Differentiate your child’s life from yours. They won’t appreciate you until later. Advice from teens’ peers counts more. Singing and dancing over poop. REALLY! PARENTING: Best excuse to play again. Let babies cry sometimes. They’ll survive! Remember, children learn what they live. Children: small people with big feelings. Be in charge but don’t bully. cranberry juice, cream carpet, big mess. They know you better than you. You’re young, but they think old. Twins; mistakes on first AND second…..
Exchange them for an older model? Kids are always interrupting, @#%$!, not…. Mom/Dad advice? Don’t. Have. Kids. Know your enemy, divide and conquer! These days taking naps is abusive. Reduce guilt. Add carrots to ramen. Reduce trauma’s terror. Buy red washcloths. Watch wee wee for pee pee. If pacifiers calm baby, use them! Buy immersion blender to disguise veggies. Let them choose their own clothes. Everything else is decided by you. Besides, they get to express personality. Recognize the signs. Preempt the tantrum. Lovey: stress soother and security giver. Movies overwhelm young children. Stay home. Yes, even your children lie sometimes. They will copy everything you do. You cannot change who they become. If you’re pregnant, you’re already Mom. Create your memories to be ageless. Chopped spinach looks exactly like parsley. Before you know it, they’re grown. Remember they are little human beings. Don’t make unreasonable or ridiculous threats. Don’t set them up to fail. Only children are awesome. Ask mine. Get on the floor and play. For quick recharge, inhale baby smell. Warning: sniff test reveals unbrushed teeth.